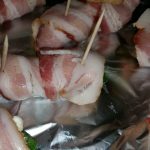 I have been wanting to share this delicious bacon wrapped jalapeno recipe with you all for a while now. I made a batch a few days ago so that I could take some pictures and to make sure I had exact measurements. The best part is you can make them mild or spicy, depending on your personal taste. Either way, they would be a great addition to any Super Bowl or Playoff Party! 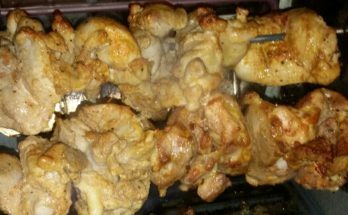 We used to just cook these on the grill, but about a year ago I decided to make them in the oven to see how they would come out baking them instead. 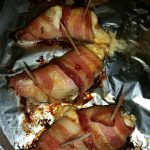 We have made these many times while camping, but I decided that they might also make a great football party snack or appetizer. I was right! Let me just warn you, every time I make these, I cannot believe how freakin’ delicious they are! 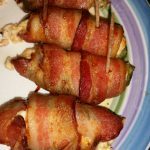 I seriously recommend making twice as many as you think you want…believe me, once you and your guests taste these bacon wrapped jalapenos, you are going to want more! 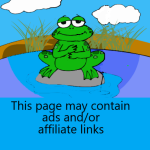 When I was a kid I loved jalapeno poppers. I always got the ones filled with cheddar cheese. But then something happened a while back…someone decided that poppers should have cream cheese and not cheddar. This has greatly disturbed me. A lot of places had the choice of cream cheese or cheddar back in the day, so I had tried both. The cheddar filled jalapeno poppers were way better. 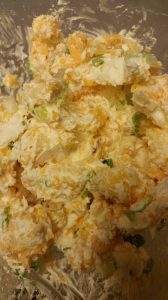 Cream cheese has such a mild flavor, you almost can’t taste it among the flavors of the jalapeno and deep fried breading. Cheddar has a more distinct flavor that held its own within the delightful little package. Now that I am older, and I don’t eat many deep fried treats, I needed to find a way to satisfy my popper cravings. 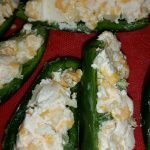 So we came up with this delicious jalapeno popper variation. I don’t know that these are really a lower calorie treat than the deep fried poppers from my childhood, but at least they are made with all natural ingredients. Plus they are much fancier. They are definitely grown up poppers. 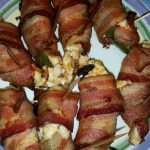 These are the best bacon wrapped jalapenos, they embrace both kinds of poppers from when I was a kid. They have cheddar and cream cheese! Now we can all be happy. Generally when we make these we make the filling ahead of time. This last time, I made it about 3 hours in advance, so that when I was ready to make them I could just put them together and cook. If you can, let the cream cheese sit out for a little while to soften up. It makes it a lot easier to stir. Depending on the temp in your house, let it sit out for 30-60 minutes for proper softening. 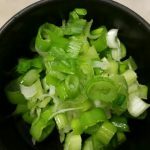 When ready, you will want to combine the cream cheese, cheddar, garlic, and green onions in a bowl and stir together. Last time I made it, I forgot to soften the cream cheese, so it was harder to combine the ingredients, but I still got it done. I just used a large metal spoon and kept folding and smooshing the ingredients together against the sides of the bowl until everything appeared pretty evenly distributed. It only took a couple minutes. 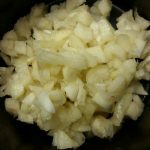 I also wanted to mention that it may seem like a lot of garlic, but when it is in there with all the other ingredients it gets lost if you don’t use this amount. I have used less, and been disappointed that I couldn’t taste the garlic at all, so don’t make that mistake. If you are super sensitive to spicy foods, you may want to use disposable gloves for this part. I don’t, but I know some people like to. Just make sure you wash your hands really well when you are done so you don’t accidentally get any spicy residue in your eye later. 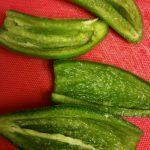 Ok, you want to cut off the stem part, then cut your jalapenos in half long ways. Try to make them as even as possible. Then you want to remove the stuff inside of the pepper, removing the seeds and the membrane holding the seeds. 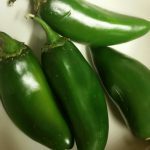 Each jalapeno should then leave you with two little jalapeno boats. If you want your bacon wrapped jalapenos to be on the spicy side, you can leave the seeds in the jalapeno halves. Another way to spice them up is to just add the seeds to the cream cheese mix. I actually just saved the seeds for myself, and basically dipped my fresh and hot bacon wrapped jalapeno in them between bites. I am the only person in my house that likes spicy food, so I have to give my food some fiery love on the side. Ok, so now you have your filling and your jalapeno boats ready to go. This part is pretty straight forward. You want to spoon the filling into the pepper halves. Make sure to fill the jalapenos up. You want the filling to completely fill the pepper, with no gaps. And it the filling should stick out over the top of each jalapeno about 1/4 inch (6-7 cm) or so. Once you have them all filled, you are almost done! Alright, now for the last step in the assembly line. Take a strip of bacon and wrap it in a spiral around a filled jalapeno and set them on a foiled pan for baking. If you are going to cook them on the grill you do the same, except you will end up putting the foil on the grill. Then do the same for each of your filled jalapeno halves. To make sure they don’t unravel during cooking I put two toothpicks in each jalapeno. One at each end where the end of the bacon is on each side. If you are baking your bacon wrapped jalapenos you will want to preheat your oven to 350 degrees. Then cook them for about 25 mins. Cook them until the bacon looks good and done. 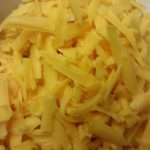 A little of the cheese might ooze out, but it shouldn’t be very much. I recommend checking on them at about 15 mins to make sure the bacon is cooking evenly on all sides of your pan. If one side seems to be cooking faster than the other, turn the pan around. If you are grilling yours, just put the foil on the grill. Keep an eye on them and turn them as necessary. You will want to make the a boat with the foil, so that the bacon grease isn’t running off. It will cause flare ups. If this happens just pull the foil to a different area of the grill. 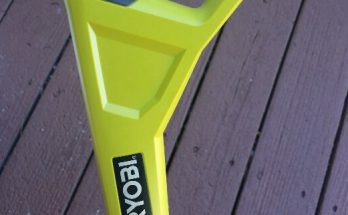 I just use tongs to tug the foil around to where I want it, and to turn or rotate the jalapenos as necessary. Cooking it on the grill is definitely more hands on than in the oven. But it totally works, and smells great too! Just cook them until the bacon looks good and done. Depending on the heat level of your grill it should take about 20 to 30 minutes. You will love these. I guarantee it! They are really great for any occasion. I just had some a few days ago, and I already want to make more. I can’t wait for all of you to get the chance to enjoy this delicious treat! If you have any questions, comments, or suggestions, feel free to let me know, either by leaving a comment below or you can use the contact form. 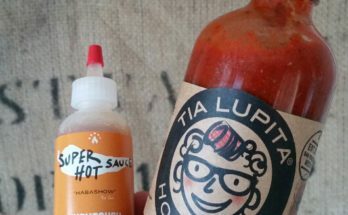 Also, please take some time to check out the rest of the website from some other great recipes, reviews, my favorite Hot Sauce recommendations, and lots of interesting information on the health benefits of chili peppers. Previous Article Simple Oven Baked Pork Roast- So Good! OMG, love these. We make it all the time when we crave for it (once a month). Grilled once but would rather have it in the oven. Sometimes though, eating these is like russian roulette. 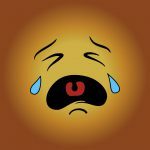 When u buy the batch of jalapenos that are too spicy for the liking. Its still good though. My friend once got creative and filled the jalapenos instead of cutting it in half. Didnt like it too much, maybe because i was just use to eating it wrapped. Hi there! Thanks for the comment. We also tried doing a whole jalapeno once. It wasn’t the same at all. Too much pepper, not enough everything else. I have heard that the more curled the jalapeno stem is, the spicier it is. So, you may want to try to pick ones that have a straighter stem for a less spicy pepper. Is it OK to say they look….attractive, lol. I’m a lover of football, and I was already thinking about Super Bowl, just last week. And how can you have a Super Bowl party without the proper appetizers? I’m sure the pork bacon gives these wrapped jalapeno peppers just the right amount of flavor. Have you ever tried this recipe with smoked turkey bacon? Hello! 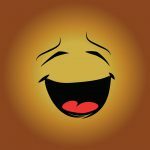 Of course it is OK to say they look attractive…I’m actually in love with them : ) You should definitely give them a try for your Super Bowl Party. If I were you I would try them even sooner actually. Who wants to wait all the way till February for these yummy treats?! I have never tried them with turkey bacon. I haven’t even tasted turkey bacon in probably 15 years or so, but I don’t see why it wouldn’t still be delicious. I am not sure on the cooking time for turkey bacon though. It might cook faster, so just keep an eye on it while you are cooking it. I would love to hear how they turn out if you do go with the turkey bacon! Just curious, you say that you make the filling ahead of time, if I make it and immediately cook it does anything need to change in cooking. Or is it just to let the taste marinate together a bit? It is totally fine to make the filling right before. I have done it both ways, and it comes out the same. I just wanted to let people know they could do it ahead of time if they didn’t want to mess with the filling when they were ready to cook. I would say that I hope you love them, but I know you will. I want to eat some right now! Thanks so much for the comment, and enjoy! I love jalapeños but have moved on to hotter peppers. However these look amazing and I think I will bookmark this so I can try to make this at home. They look easy to make and you have written in good detail what to do. Great spicy read! Thanks for the comment David. I don’t see why you couldn’t do this recipe with a spicier pepper. I think it would work great with a habanero. You just wouldn’t want to use some tiny slender pepper like a Serrano or Cayenne, because you wouldn’t have enough space for the filling. I would try it with a habanero myself, but no one else that I know would eat it lol. I do love the idea though. I think I will just try adding one habanero to my batch next time for me to try. Sounds awesome! Make sure to let us know how it turns out when you try them for yourself.